Sheffield is just below Newcastle in its ability to make me swoon with adoration. It's a wonderful place. Step out of the station and you have that fantastic square, with stainless steel and fountains. It's a city that's big enough to give you everything you want, to let you lose yourself, but small enough to feel fun and bohemian and friendly. Just walking past the Crucible gave me a little thrill; my dad was snooker obsessed in the 1980s - there were bound copies of Snooker Scene on the shelf next to the telly - and so the Crucible is woven in and out of my childhood. It's probably why snooker is one of the few sports that I find acceptable, even entertaining. 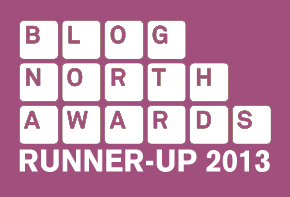 (Please note: while snooker is great, pool is an awful Yank abomination). 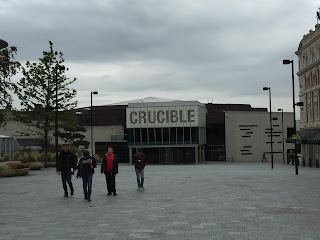 I remember being surprised to learn, somewhere in my teens, that the Crucible was a theatre. I'd always assumed it was the Wimbledon of the game - it still feels odd to me that one week they're hosting an international sporting tournament and the next it's An Inspector Calls. 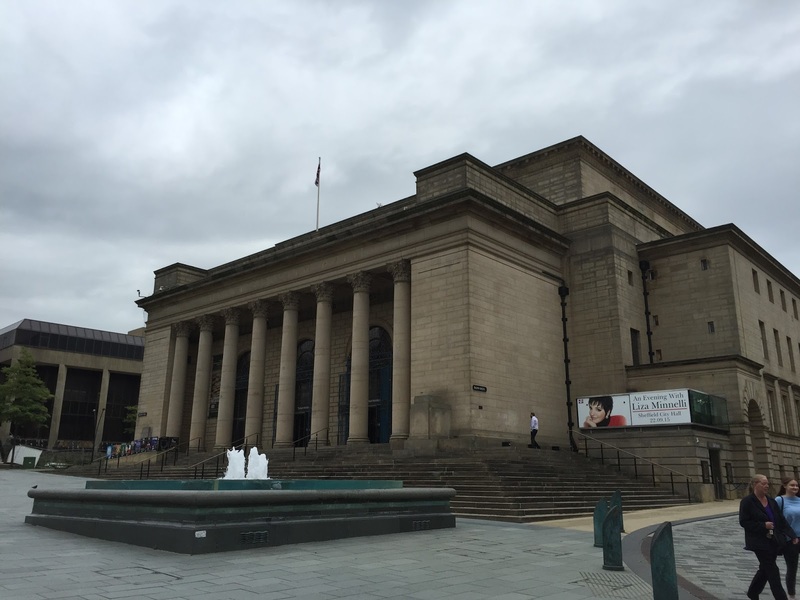 Across the way is another of Sheffield's tiny pieces of genius, the Winter Gardens. It's just an arcade with a few plants in it, really, but it's such a wonderful idea. It's a sheltered place for people to just... sit. That's all. There are cafes round the edge, yes, and a hotel and an art gallery immediately adjacent, but there's no obligation to spend. If all you want to do is enjoy the trees and plants, you can, and no-one will stop you. Such a refreshingly egalitarian concept. 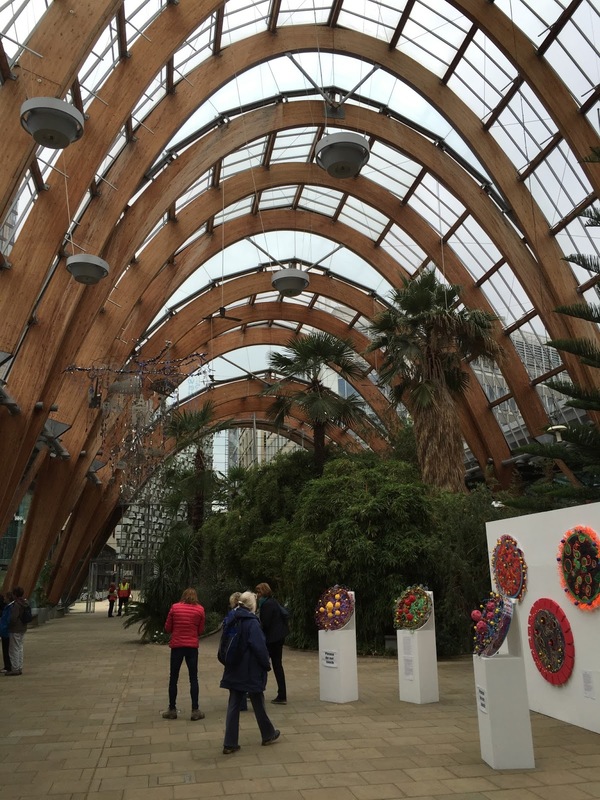 There should be Winter Gardens in every city. Instead of making us consume, make us enjoy. Of course, this is all part of Sheffield's unabashed leftiness and dedication to the working classes. The square outside its Town Hall - a Baronial confection that looks like it's sitting on top of the Batcave - isn't named for some Victorian entrepreneur, but is instead called the "Peace Gardens", while the fountains are dedicated to a Chartist rebel. Sheffield does have a vested interest in promoting international brotherhood, given that it was ground zero for a nuclear attack in Threads. I watched just the trailer on the train over and it's one of the most harrowing pieces of film in history; the actual programme makes you want to (a) find a nice comfortable corner somewhere to cry out all your bodily fluids and (b) donate all your money to CND. It's absolutely horrific, and you should see it, although I wouldn't watch it if you're on any kind of anti-depressive. Or you live in Sheffield. One thing that baffles me about Sheffield is: how are there any overweight people in the town? Up and down you walk, entire streets built at sixty degrees from the vertical, hills appearing from nowhere and rising straight up. You think a building is perfectly normal, then walk round the back of it and find a sudden drop down to the car park. I walked from the station to the City Hall at what felt like a constant uphill rise and I was drained when I got there. The last time I was in the city for a wander about was with Diamond Geezer, and we'd been out wandering in the Peak District: that was a pretty dance among the flowers compared with the slog I'd just experienced. 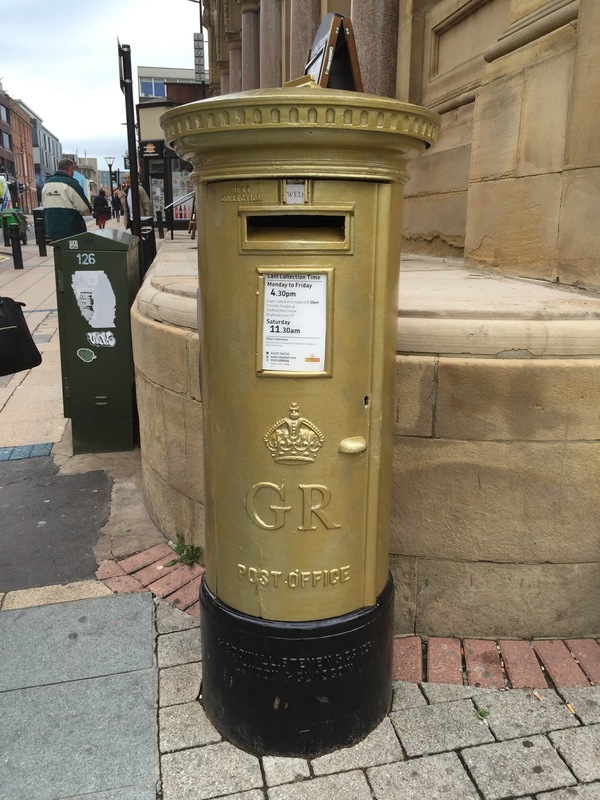 That's Jessica Ennis' gold post box! Seriously, it's becoming a new obsession. I was crossing the city in search of one of Sheffield's other selling points: its trams. 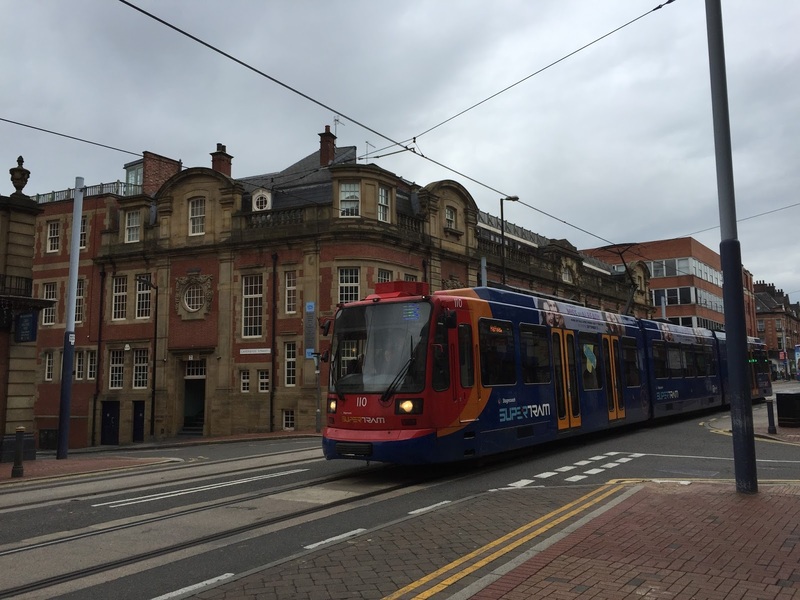 Opened in the mid-90s, the network suffers from one of the worst websites in the world (seriously guys, it's 2015) and labours under the name "Supertram", but it's otherwise a real asset. I headed out to the University of Sheffield stop. I'd like to pretend this was because I wanted to experience the city just a little bit longer, but in fact it was because I completely missed the City Hall and West Street stops. The northbound ones had shelters and grand signs, but the southbound ones just had a bit of metal stuck in the ground; I managed to walk right past them both. 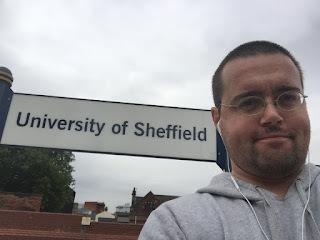 It turned out to be for the best, because the University of Sheffield stop is right next to a tunnel exit, and you know how excited I get about tunnels. Yes, I do know it's very Freudian, I have A-level Psychology. On board, the trams are sort of... odd. 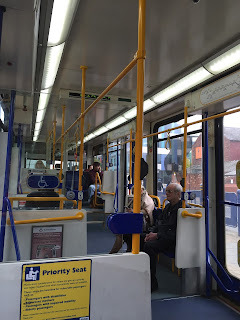 I'd been on the Metrolink only a few days before, and Manchester's network is the gold standard for British trams. They're clean, efficient, fast, and constantly expanding. 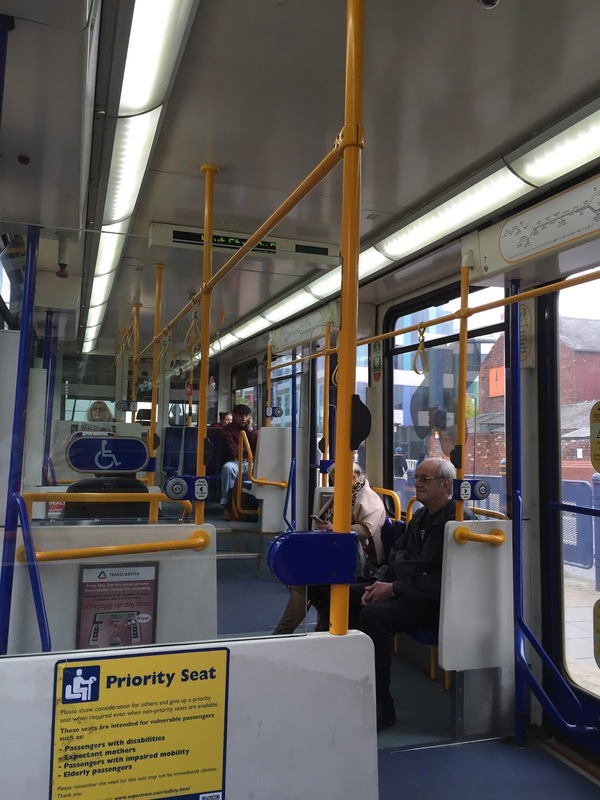 Supertram is a weird bus on rails. There are steps inside, for a start, which I'd seen before on the also disappointing Birmingham tram network. The Stagecoach livery has permeated every square inch of the design, so it doesn't feel that different to a double decker. You don't buy tickets from a machine before boarding, as on Metrolink. Instead there's a conductor selling tickets from his little machine like it's 1935. And all the stops are request stops. The tram will only pause if you ring the bell, like a bus, though in practice the tram actually stopped at every single halt on the way. So that was a bit of a waste of time for everyone. 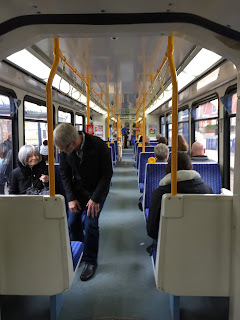 Still, it was a thrill to be on board a tram, to hear that gentle electric purr as we whizzed through the streets. 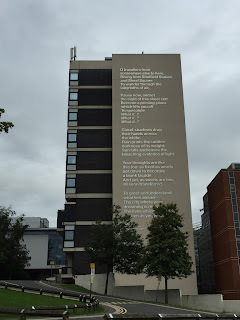 After Fitzalan Square-Ponds Forge stop we crossed the road on a bridge - past one of the least enticing tourist signs I've ever seen, directing visitors to the Cholera Monument - and giving us a view of the Brutalist joy that is Park Hill flats. The route was less attractive then, curving behind industrial estates and through deep embankments. For a while we shadowed a canal, then there was the giant bulks of a retail park and a stop called "Valley Centertainment" which made me furious. 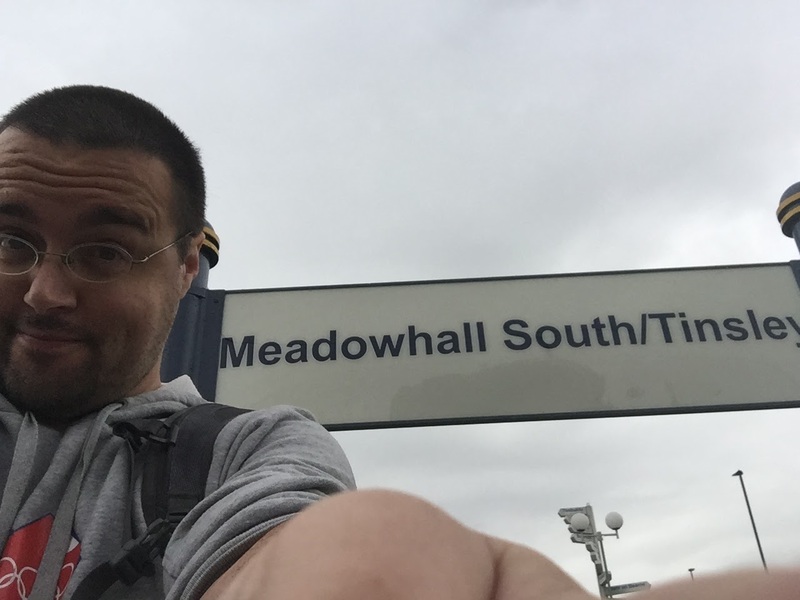 I got off the tram at Meadowhall South/Tinsley, and struggled to fit all of that in a sign pic. 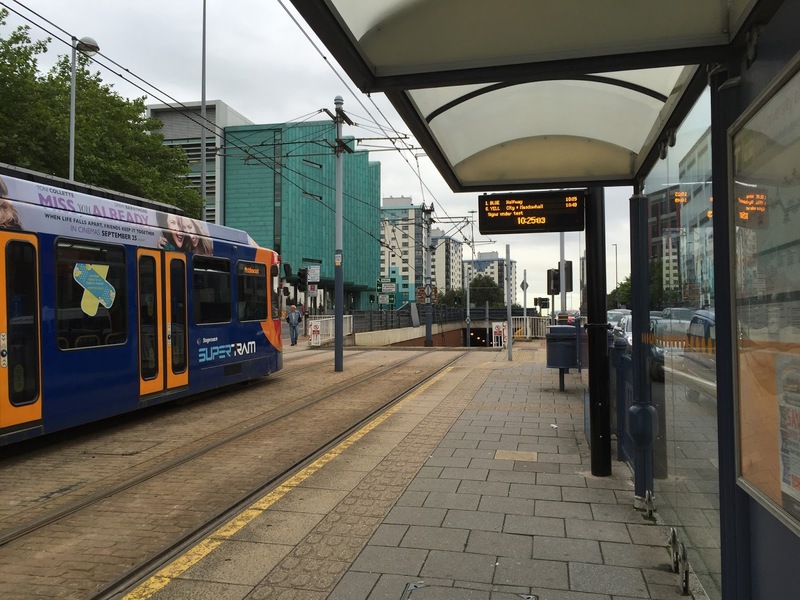 A tram route in the UK is something we should treasure, but I feel like Sheffield isn't making the most of it. There are tentative plans to build a new route to Dore, if HS2 ever gets this far, and a tram-train pilot to Rotherham that may happen one day, but beyond that nothing much. The tram needs to work a bit harder if it's going to be as fabulous as the city it serves. I completely agree, from my last visit, that Sheffield is an upliftingly wonderful place. Although I think we spent most of our time in the pub. 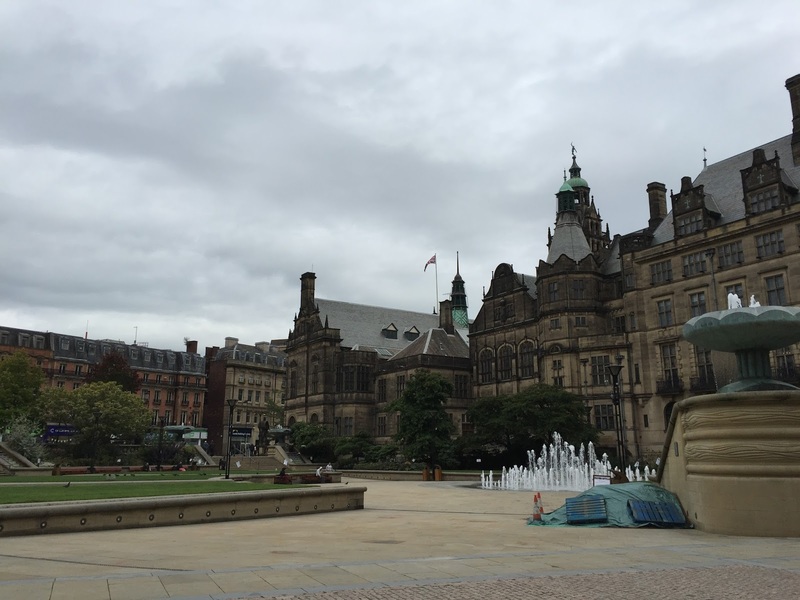 It's funny but the last time I was in Sheffield all I really found was strip clubs and dubious bars. I was amazed at how many strip clubs there could be in such a short distance from the station to the offices of a large corporation I was visiting for work purposes. At lunch, we were taken out for lunch. In the main shopping district the best we could find was a Debenhams cafe. Obviously I was in the wrong part of town to see its highlights. As for steps on trams, the older London ones have them too. The new ones - all six of them - don't. We didn't drink ALL day, DG. There was the eating bit as well. There is definitely a dodgy bit to Sheffield; I stumbled into it myself when I went there one time. I suppose it depends which way you go. 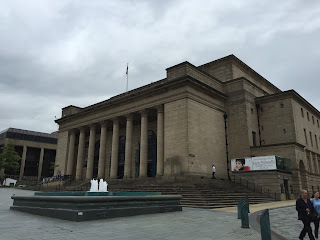 If you stepped out of Lime Street and turned right you'd get St George's Hall, the Walker Gallery and the Wellington memorial; if you turn left you get strip bars, cheap pubs and kebab shops. re overweight people in Sheffield, once when I was there (very near the Crucible) a beggar appoached me, leaned off his crutches, and waved one in the air while saying "Tha's got a pot belly, tha can spare me some change". re Sheffield's politics, it was twinned with uber-Soviet city Donetsk, Ukraine, while it still bore the name Stalino. We had to watch Threads in Humanities class when we were 13, while the teacher pointed out on a map whether we'd instantly, die days later from burns or radiation poisoning weeks later. Cue people going out to be sick and another generation of teenagers suffering nightmare and scared for life. I haven't dared watch it since though it's on my computer. 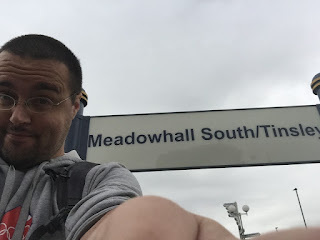 When Meadowhell was built they needed a back up plan if it failed as a shopping centre. The back up was a prison. It's also surprisingly hilly in there but unless you're pushing pram or wheelchair you don't realise. But as a Sheffielder I always assume the centre it relatively flat. 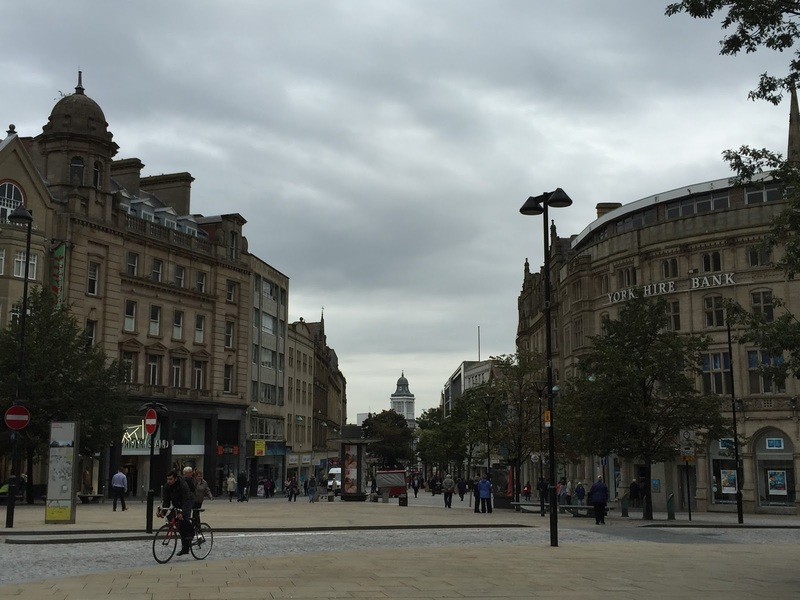 I didn't realise how steep fargate was until someone pointed it out to me. I always said the Superpram goes from where nobody lives to where nobody wants to go. 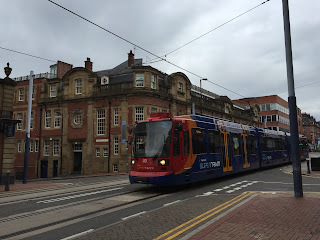 It's improved since they realised it helps if buses from places where people live (like my parents village) link in and stop at the supertram stops so they can get to town quicker.